Looking for private in-home or in-studio Broadway Singing lessons? Our Bronxville teachers are ready to get you started. Find your teacher today! Check out some of our most popular teachers near Bronxville, NY including New York, Brooklyn, Bronx, Jersey City and Astoria. For individuals 5 and up looking to develop or polish their musical theatre repertoire, I'm here to get you to the next level! From classic Golden Age musicals, Disney, to contemporary musical theatre, we will work together to get your rep solid and ready for auditions (community, pre-college, college, and professional levels) and any upcoming performances or other avenues. If you're seeking a technician who is able to coach you dramatically and be in alignment with your temperament, needs, and goals, I'm your gal! My teaching is based in the Bel Canto tradition of classical singing, adapted for the specific demands of the musical theatre style (head, chest, mix, belt). Welcome! Thank you for visiting my page. I am a professional opera singer and native New Yorker. I am so excited to reach out to new and continuing students in NYC - for both voice and piano study at all levels from age 5/6 and up. I am an active performer and I love to share my passions and knowledge with my students. I have 13+ years of individual one-on-one voice and piano teaching experience with students of all ages and abilities. What sets me apart from the other teachers here at TakeLessons? I bring a special warmth, dedication, wisdom, and commitment to our work. Lessons are not solely about technique or making good sounds, but about communicating musically in a more meaningful way, and unleashing your unique gifts. nts age 12-18, I emphasize a combination of folk songs, Disney, a limited selected pop music, and more. Ages 5-11 I use a combination of vocal method books for very young singers in addition to selected musical theatre and Disney songs. My voice students have performed on and off Broadway, been nominated for NJ Paper Mill Playhouse's Rising Star Awards, have been accepted to pre-college musical theater programs on full scholarship, have earned multiple leading roles in high school musicals and plays, have performed major choral works at Carnegie Hall, have sung in church choirs and for weddings, and have released their own pop/rock albums. I look forward to the pleasure of meeting and working with you! We will primarily use Bastien method books, Faber Piano Adventures, Dozen A Day, and other supplemental material according to age and level of the student. Musicianship and theory skills are explored and nurtured in addition to acquiring a foundation of technique at the piano. Regardless of age or skill level, I approach students with respect and professionalism within a safe and supportive environment, fostering enlightenment and creativity. We will take your vocal study at your own pace through a personalized, holistic approach that will help you sing easily and beautifully. I can't wait for you to join me! Studio: Piano/keyboard 88 keys, open space, full length mirror. I emphasize a variety of holistic methods that serve the student in multiple ways: physical, emotional, aural awareness; posture and alignment; low-centered/connected breathing, breath compression; open throat, released tongue/jaw; legato line, phrasing; articulation, diction, style, artistry; the process of learning a piece of music. Genres: Classical, Musical Theatre, Pop. I enjoy helping students to prepare for auditions and performances, as well as explore the art of singing and encourage the joy of singing. Nicole is a smart welcoming teacher with lots of patience when practicing with your voice. She gives great critique when needed but is still able to offer solutions to problems you might be experiencing with your voice. She has a positive attitude all around with no room for negativity. It's all about being comfortable in exploring your voice with no judgement. Great teacher all around ! Nicole is a wonderful teacher, and always made me feel comfortable to work through my weaknesses and helped to mold them into strengths. Nicole is an excellent teacher who brings great knowledge and enthusiasm to every lesson. I always look forward to working with her! Broadway singing from Seussical to Grease to Beauty and the Beast to your own favorite Broadway show tunes. Learn new songs and improve your vocal performance. Alongside theatrical, on-camera and concert performances Wi-Moto has worked as a teaching artists for both young and adult students in Philadelphia, NYC, Duesseldorf, Cologne, and Budapest. The lessons are tailored to meet the goals of the student(s) and usually culminate into some kind of performance, video, or audio recording. For young performers the emphasis is on creative learning, games, and other fun activities to instill confidence, build repertoire, and establish a work ethic. For adult performers lessons are based on the needs of the student(s) and their schedule. Voice instruction, theater, and music theater performance for ages 3-17 yrs, audition and music exam prep as well as bilingual workshops and intensives. Group and individual vocal training in Broadway and Pop styles for adult students. I am a poet and I began working with Wi-Moto as a means to empower my stage presence. Working with Wi-Moto was pure joy. She has an ease about her that just makes you comfortable with yourself when in her presence. She is very attentive and passionate about the work that she does, I truly felt like she was routing for me in each of our sessions and constantly challenging me to go deeper emotionally. I learned so much about myself and the skill of acting while working with her. Overall, Wi-Moto was very professional, She was always ready to work when I arrived and her studio space is very open with lots of sunlight and good vibes. Wi-Moto creates a stress free environment where productivity is always guaranteed. After working with her for only 8 weeks my vocal range was expanded dramatically. She helped me snag the lead in my schools musical and worked with me on my college audition monologues until they were perfected. If your looking for a acting or vocal coach look no further. Want to learn how to sing like the broadway stars? I can help! I have mastery over belting, mix and legit vocal styles and can help you to find where you shine! Hi, there! My name is Elizabeth and I can't wait to meet you! I've been teaching private lessons since 2012 and have loved helping my students get into esteemed education programs, succeed in competitions, ace auditions, and gain a sense of mastery over their voices. I went to Carthage College and earned a degree in Musical Theater in 2011, and Bowling Green State University for my Masters in Vocal Performance/Opera in 2015. I'm a friendly and open-minded person and I would describe my teaching style as efficient, creative, and fun. I've worked with students of all ages, backgrounds and abilities to achieve a multitude of different objectives. I look forward to helping you reach your goals! Elizabeth is a very nice and competent vocal trainer. She always encourages me to try new exercises that help me a lot to improve my singing skills. I also feel very comfortable taking classes with her, and I think that one of the basic things for me when it comes to learn how to sing, a nice atmosphere is necessary to grow faster. She is also helping me with my English pronunciation. I would definitely recommend her. Elizabeth is an amazing tutor. She is very friendly and funny and makes you feel comfortable doing all kinds of exercise. She collaborated with me on what I wanted/needed to work on most. She helped me improve singing a song that I chose through many elaborated techniques. I learned a lot even though I only took two lessons (because I left the country after that). She's friendly, kind and open. Her directions are clear and helpful. She's really interested in helping her students achieve their goals. 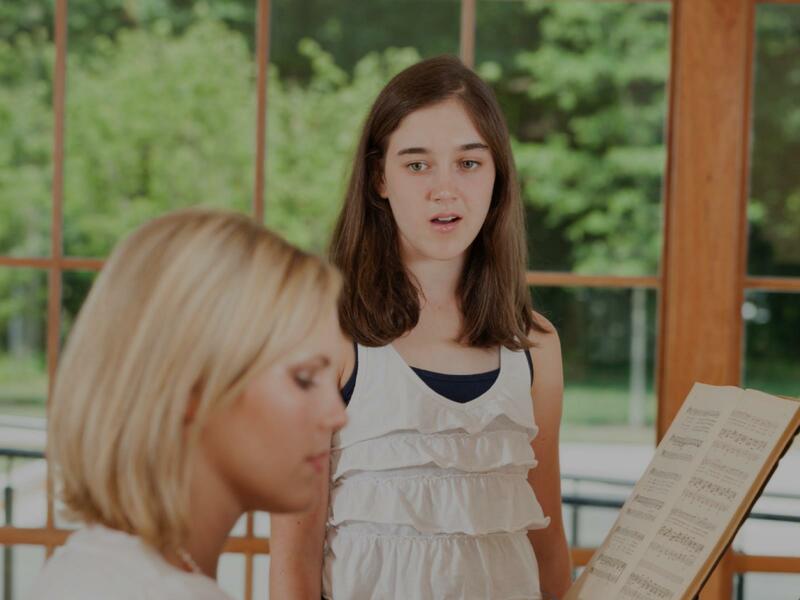 If you are looking for voice lessons for yourself, your child, or a friend, my lessons are engaging, student-centered, and never intimidating. No longer study with a teacher that is "set in their ways" - I have a plethora of teaching strategies that are current, and vibrant, geared toward the needs of the individual. My extensive performing skills in addition to my vocal pedagogy training make my lessons well-rounded and highly effective. Lauren is an avid and renowned music performer and educator in the US and abroad, currently building upon her thriving private music studio. Receiving her degrees from Bard College (BA - Piano Performance, Vocal Performance, Theater) and Columbia University (Music & Music Education), she has the excellent training to back up her skills in performing. Focussed on a student-centered rapport at the forefront of her teaching philosophy, she is dedicated to meeting the needs of her students. She has a plethora of experience and teaching strategies to tailor toward her students. I am an adult who always wanted to be able to sing and express myself through music, but unfortunately did not have the natural ability to hold a tune. Lauren worked with me to systematically develop my range and strengthen my voice and vocal confidence. I am learning a lot of practical techniques, and Lauren gives me lots of individualized feedback and helps me develop good vocal habits/health. Lauren is a kind, professional and overall lovely teacher. She started with us teaching my 11 yo daughter piano but we have since switched to singing because that is what my daughter wants to do and Lauren is extremely qualified. Laura's lessons are fun, high-energy, and tailored to meet every student's goals, whether it is to become a Broadway star or living room diva (or divo)! With over a decade of experience teaching both privately and in classrooms, Laura loves to help singers and actors excel at auditions, competitions, and performances by guiding the performer to connect with the storyteller inside. Her students have performed on and off Broadway, at Carnegie Hall, in national tours, on TV, and in theaters all across the US and Japan. And you can be next! Laura was wonderful with my 5 year old girl, she was patient, energetic and her love for music showed through! My daughter has been very motivated to practice her songs to show "Ms Laura" next week. We look forward to working much more with Laura. Whether you're a beginner who has always wanted to sing or a professional with an active career, I can help develop your technique, improve the quality of your sound, and use your voice as a tool for self expression. I have a unique background in that I am a professional performer myself, an educator with a Masters Degree in performance and pedagogy, and someone who has regular “behind the table” interaction with the Broadway community and colleges that offer Musical Theatre degrees. I have worked on the Voice Faculty at New York University, Cap 21/Molloy, the American Musical and Dramatic Academy, and Broadway Artists Alliance. I also trained as a Vocologist and Singing Voice Specialist with members of the NYU Langone Voice Center medical staff, and I am passionate about voice science and helping singers stay healthy for life! The human voice fascinates me and I absolutely love working with singers of all levels to build their technique, explore what is unique about their sound, and keep a healthy voice for life! I have been a professional singer for two decades, and I also have a Masters Degree from New York University in Vocal Performance and Vocal Pedagogy. I have been a member of the Voice Faculty at New York University, Cap 21/Molloy, the American Musical and Dramatic Academy, and Broadway Artists Alliance. I have additional training as a Vocologist and Singing Voice Specialist through the NYU Langone Voice Center. how to keep it healthy for life! Specialties: Belt and Mix Techniques, Musical Theatre, Audition Preparation, College Audition Preparation, Working with Your Voices, Working with Compromised Voices (Nodules, Polyps, Bowed Vocal Folds, etc), Working with All Levels, Online Coachings, Some Experience with Transgender Voices. Ashleigh is an amazing coach. Ashleigh has been coaching my daughter for about five years via Facetime. The improvement in my daughter’s song interpretation and acting ability has been steady and incredible. Ashleigh knows how to prepare students for auditions. She has prepared my daughter for college auditions (from exploring and picking materials, to having all pieces ready). Most importantly, Ashleigh is always there for us answering questions and being supportive. We love her positive and happy disposition, which makes her easy to work with no matter how stressful the situation. We love Ashleigh! Ashleigh is such a wonderful person to work with! She is incredibly thorough and helped me find material that really resonates with me. Her warmth and sense of humor create a fun and welcoming lesson environment! She focuses on telling the story which is so important to me as an “actor who sings”. I couldn’t recommend her enough! I started taking lessons with Ashleigh after a 2 year period of not singing due to bowed vocal chords. In the short period I’ve worked with her I feel like I’m regaining the voice I was once had and then some. She’s extremely knowledgeable and patient. I’d recommend her to anyone. Can't find a teacher in Bronxville, NY? "You are a great teacher how can i get in touch with you we you drop me your private email so we can talk better am waiting ok tinabruce4reaal@gmail.com"
New York, NY teacher: Laura K.
r, I started to take private lessons with her to compliment some of the training in singing we were getting there. Even now after graduation, I am still training with her. Our focus now is on continuing the development of my singing voice. My goal is to reach a level where I have the skill and confidence to audition professionally for musicals, and I know I am in great hands." New York, NY teacher: Laura S.
se of humor create a fun and welcoming lesson environment! She focuses on telling the story which is so important to me as an “actor who sings”. I couldn’t recommend her enough!" New York, NY teacher: Ashleigh J.
sessions than I have with any of my previous instructors. I'm painfully self-conscious when it comes to singing, but she was very encouraging and patient. She takes time to explain all the exercises she gives, ensuring that I'm able to understand how they would help in improving my voice. Highly recommend her to anyone who loves to sing, but might be shy like myself!" New York, NY teacher: Meghan L.
out. Within the first lesson I could already hear an improvement in the strength and tonality of my voice. She was also very precise about rhythm and other techniques in the songs I was singing. Pity I can't continue my lessons with her as I am leaving New York! Thanks for your help Marjorie!" New York, NY teacher: Marjorie K.
m looking forward to working with her more. :)"
New York, NY teacher: Jennifer V.
New York, NY teacher: Paul M.
"Christiaan came to our apartment and really helped my son get ready for audition season"
"Great first lesson! Not just for the physical aspect but also the mental/philosophical. Great teacher, great person." New York, NY teacher: Gabriel W.